On Monday I saw my first “Automated Ordering Kiosk” at McDonald’s. Even this bastion of part time jobs for school students is being automated! How are kids supposed to learn to “clean as you go” or about customer service, punctuality and responsibility?? Those young managers at McDonald’s did a brilliant job training school kids for 40 years. Now McDonald’s is reducing the number of staff it employs as it moves to self service. There goes another job opportunity for millennials. The message is clear. Kids cannot prepare for a career in the 21st century by expecting to do jobs from the 20th century. Families need to build their own 21st century support system to prepare their children for future careers. The Method of the Grandmother 2.0 connects your network of family and friends into the collective task of raising your child. By grounding your child in your family’s values they will have a solid launching pad. The online world gives your child another edge. There are thousands of career sites. These government sites provide current, unbiased and professional information. The WA Careers Centre is in Forrest Place. It provides free information and counselling and you can find a lot of their resources, including occupation videos online. The Commonwealth government Education Department provides a number of resources including the Careers Bullseye Posters. These can be a bit of fun. You only have to choose 3 posters and pick a few jobs in each one to be able to see a trend towards potential careers. Once you have picked out some jobs check them out on the WA Careers Centre site. Youth Central is a Victorian Government site that I love. It gives information not found on the other sites… from study skills, how to write a CV when you have never had a job and how to make the most of a gap year. Today they have a story up about binge drinking. MyFuture is the national careers site supported by all governments (except WA and NSW!). If your child has a WA Education Department email address you will be able to use that to access the site. If your child goes to a non government school their school may have subscribed which means their school email address will get you access. It is simply the best careers site so worth some effort to log in. These sites provide a solid foundation of careers information and advice and they can send you off in a thousand directions when you find things you are interested in. No other generation of parents has had to cope with so much change. It has never been harder to design a future where kids can be great. The information on these sites, teamed with your network of family, friends, teachers, career advisors and other professionals, will help you to grow your child into a future ready citizen. 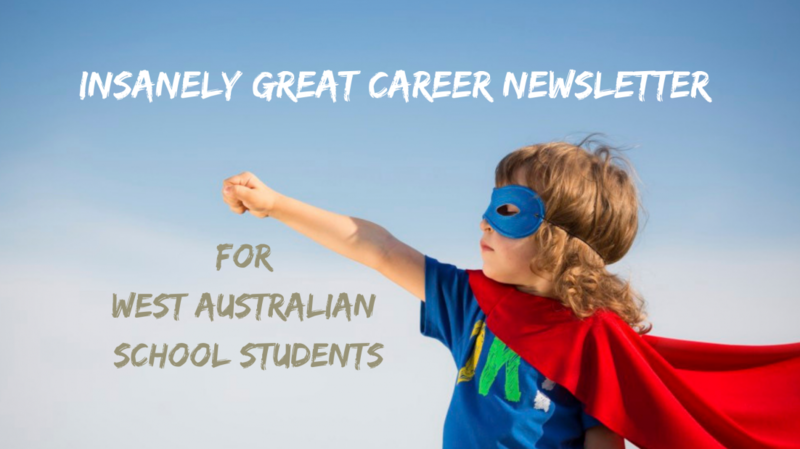 Categories: Career Advice, Parents, Year 10 | Tags: 21st Century Careers, Parents | Permalink. The future of education is here, it is just unevenly distributed. Sugata Mitra and Charles Leadbeater are international leaders providing glimpses of the future of education. Through their excellent work they create and report on prototypes of learning that are preparing students for the 21st century. While most of us are stuck in traditional 20th century systems we are conscious that they cannot deliver citizens who are prepared for the 21st century. Most of us are not aware of how fast the world is changing outside the school gates. Leading educators are conscious of how incompetent we are in trying to prepare kids for 21st century careers. Sugata Mitra and Charles Leadbeater are competent and conscious of the pockets of knowledge that they are sharing. If you ever hear of anyone who thinks they are unconsciously competent they are probably just not aware of what is going on. There are pockets of innovation and experimentation happening across Western Australia. We need to start sharing our ideas so that we can stand on the shoulders of the giants amongst us. Our first task is to start talking to each other. Categories: 21st Century Careers | Tags: 21st Century Careers, Innovation | Permalink.